Playwrights who used the Cino for early productions of their work included Doric Wilson, John Guare, Sam Shepard, Lanford Wilson, Robert Heide, H. M. Koutoukas, Robert Patrick and Tom Eyen. It was at the Cino that the musical Dames at Sea was first presented. Some of the productions later went on to play at other venues. La Mama's inaugural play, for instance, was Andy Milligan's production of Tennessee Williams' One Arm which had previously played the Cino. The La Mama production opened on July 27, 1962. 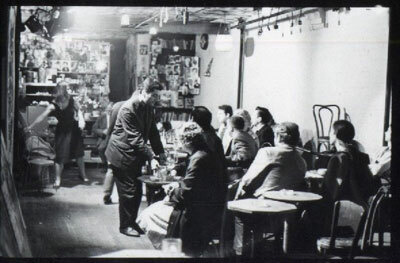 When a fire in March 1965 caused the Cino to be shut down temporarily for renovation, Joe Cino presented productions at La Mama on Sunday and Monday evenings. (CC95-96) La Mama also toured Cino productions in 1965. According to Wendell C. Stone in Caffe Cino: The Birthplace of Off-Off-Broadway (Carbondale: Southern Illinois University Press, 2005), the benefit took place on April 26, 1965 at the Sullivan Street Playhouse. The benefit for the Cino was a result of a fire at the venue which resulted in its temporary closure. (CC99) Stone also notes that a revival of the play took place after the run of performances that opened in July 1965 during the following September. (CC105). The play was the producing debut of Ron Link. 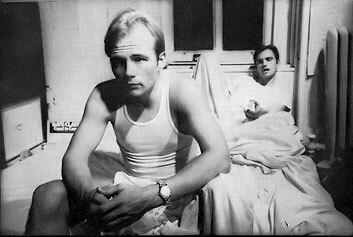 Link would later go on to produce Glamour, Glory and Gold by Warhol star Jackie Curtis and Women Behind Bars starring John Water's transvestite superstar, Divine. Some of the Cino regulars blamed the Warhol crowd for the proliferation of recreational drugs at the Cino. Cino director, Andy Milligan, thought the "Warhol people" ruined the Cino. Ondine disagreed. According to Milligan biographer, Jimmy McDonough, "even [Johnny Dodd] concurred that drug use intensified upon the arrival of the Warhol set. Ondine and company brought in 'bushel baskets full of pure methedrine. It was like you had to sweep it out of the way - way beyond what people could use.' During the nightmarish month-long December 1966 run of A Christmas Carol, starring Ondine and filmed by Warhol, the Cino turned into a shooting gallery. 'Joe asked me to be in a show one of the Warhol people did,' said Robert Patrick. 'They were all drugged out of their minds. The dressing room was a mass of cookers and needles... it was just drugs day and night.'" (GO63) Keith Carsey, an actor at the Cino through 1963, later recalled to Patrick that he (Carsey) "dropped out of the Cino when the drugs arrived." (RP062709) Drugs would ultimately be the downfall of Joe Cino. Although Smith got Cino to the hospital, he (Cino) developed peritonitis from his wounds and died on April 2, 1967. His death made the front page of the 6 April 1967 issue of the Village Voice. What he demanded of a play and production was that it come to life; when it didn't, he could drive people to hysteria trying to kindle the spark he believed in. He had little patience with limitations of nerve, passion, or energy. He despised ego games when they detracted from the work. If he was sometimes impossible to work with, it was because he was sometimes bitterly disappointed. Joe Cino loved people for their uniqueness. He loved the energy that flows from people doing what they love to do. Best of all he loved 'magic time,' that moment of infinite possibility when the lights dim and an unknown world miraculously comes alive." Michael Smith's website is at: here. His blog page can be found here. Doric Wilson's website is here. His blog page can be found here. Some of Wilson's plays are available here (And He Made a Her includes a recording of the Caffe Cino production on CD.) The website for "The Other Side of Silence" - the first professional gay theatre company in NYC - founded by Wilson, Billy Blackwell and Peter Dell Valle - can be found here.